... who can resist a tick? Black-winged Pratincole is a very rare bird in the UK. There have been just 36 records up to the end of 2012 according to Rare Bird Alert. There was one reported last year that we heard about but that did not linger and was only seen on one occasion. If last year's bird is accepted then the current individual that is doing the rounds of the east coast of England will be the 38th. It first appeared up in the north-east but did not stay anywhere very long, visiting Northumberland, Durham and Lincolnshire before arriving in Norfolk. Black-winged Pratincole is separable from the very similar Collared Pratincole by the black underwing which is rufous or chestnut in Collared and also Oriental, the other pratincole species that occurs as a vagrant (less than ten records) in the UK. Collared Pratincole also displays a white trailing edge to the inner wing but this can be difficult to see when the feather tips get worn. Black-winged Pratincole is generally darker than Collared with less contrast between the primaries and the rest of the upperwing and back. As we have no photographs to illustrate these differences I knocked up a quick sketch; the colours have not reproduced well. Artwork: Rick Simpson. When standing the Black-winged Pratincole's wings are longer than the tail, in contrast to Collared where the tail is very long and extends beyond the wing tip (beware of juveniles with short tails though). We did not see Black-winged Pratincole on our travels because we were too early when we visited southern Africa which was our best hope. 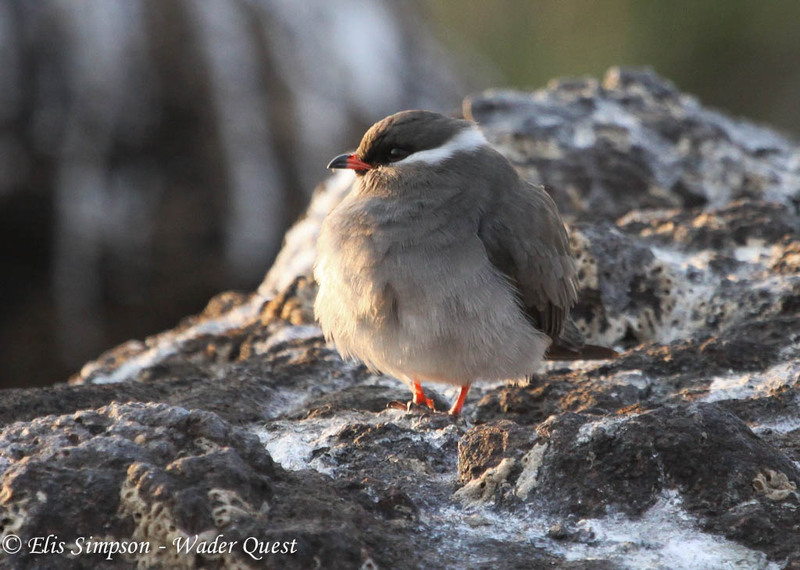 We also missed the aforementioned Oriental Pratincole, again by being too early on their wintering grounds in Australia. We also had a chance for these in Thailand, but again we did not connect on either of our visits. We also had bad luck with the Small Pratincole in Thailand when shortly after our visit our friend Tommy Pederesen saw one there; we had rather hoped to see this last species in India, but we were out of luck and did not do so. 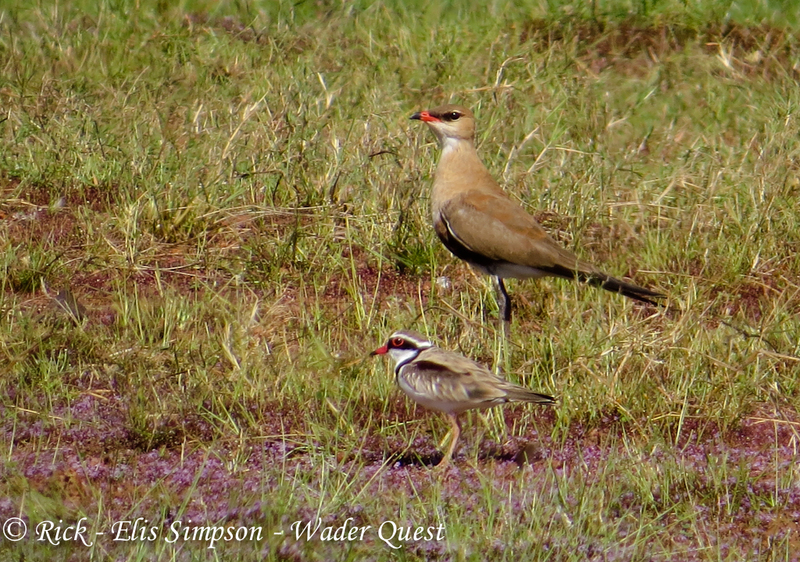 On a more positive note we did see the delightful Rock Pratincole in Botswana and the long-legged Australian Pratincole on our visit to Broome. Rock Pratincole Glareola nuchalis; Kasani, Botswana. August 2013. There are two further species of pratincole that we didn't look for, Madagascar Pratincole and Grey Pratincole, something for the future perhaps? So what of our 'twitch' then? A mad dash (leaving at lunchtime - see what I mean about twitchers?) and a casual mid afternoon arrival at Stiffkey Fen found us gazing at a distant Black-winged Pratincole. It spent much of its time loafing on the deck where heat haze was a problem for photographs, but did have a little fly around with the Northern Lapwing flock when a Eurasian Sparrowhawk flew by. It is in flight where its main characteristics can be noted helped by the fact that is is also clear of the heat haze at ground level. It was a pleasant afternoon, hot and sunny with a refreshing breeze coming off the sea. Among the other waders present were Common Sandpiper, Common Redshank, Grey Plover, Ruff, Black-tailed Godwit, Northern Lapwing, Euraian Oystercatcher and Pied Avocet. Stiffkey Fen, a bustling marsh. There was but a small crowd admiring this bird and a lady joined us choosing to stand alongside us. She was having trouble locating the bird due to only having bins to look through but we were happy to offer the use of our scope and she was very happy to accept. During our chat with this friendly lady it transpired that she had only seen one pratincole in the UK before and that was Oriental! I told her she was doing this listing lark in the wrong order and that she had a duty to now go and look at the Collared Pratincole in Suffolk! The Wader Quest list has not seen any action since India in January, so it was good to be able to add one more bringing the total to 176. We're pretty sure we will not see all the waders in the world for one reason or another, but we would like one day to get to be members of the Wader 200 Club, not that such a thing exists to our knowledge, but it sure will if we ever get there! We then moved along the coast to Titchwell, one of our favourite spots, but the birds were not coming close to the hide; however we did see a fine breeding plumage Red Knot, some scruffy looking Ruffs, Pied Avocets of course, Dunlins, a quartet of Spotted Redshanks, Common Redshanks, Black-tailed Godwit and Northern Lapwings in good numbers plus the odd Eurasian Oystercatcher, a pair of Eurasian Curlews and a fly by Eurasian Whimbrel. Hi Ashley. Lifer for Elis, Wader Quest tick, only my second ever, not a hard decision to make, although it still took us long enough. As it moves south I guess it'll end up on Willen and make us look really silly!